Every good baker knows that a recipe is really just a jumping off point. You might like nutmeg, while I prefer cinnamon. You’re all about cocoa powder, while I favor melted dark chocolate in my brownie. It’s all a matter of taste. The same holds true for literary romantic heroes. You might like them dark and brooding, I’m all about funny and charming. But as I write and rewrite not one but two different YA stories, I’m thinking about what ingredients make up my idea of a romantic hero—and how best to create a fella that appeals not just to me, but to (hopefully) a larger audience at some point. When it comes to creating a hero with humor, Jane Austen might have fashioned something akin to perfection in Northanger Abbey’s Henry Tilney. He’s got a great sense of humor—so much so that occasionally it’s hard to get him to be serious. But when the going gets tough, Mr. Tilney rises to the occasion. Even if he might joke around as he’s doing it. Never was there a more delightful literary clergyman, or one with whom the reader can more readily share the heroine’s completely obvious affection. And not just of the romantic variety (though clearly that’s a must as well). The ideal in this category for me is George Elliot’s Will Ladislaw, the young man who ultimately captures the heart of Dorothea Brooke in Middlemarch. Even when Will is idling his time away on his cousin’s dime, he’s passionate about art, beauty—and his cousin’s wife Dorothea. Ah, youthful enthusiasm. But even Will settles down to a real pursuit and career at last, and he’s got politics and reform on his mind. His zest for the downtrodden and ignored—as well as for the best heroine in all of literature (yep, I said it and I meant it)—make him pure romantic hero gold. On a certain level, rare book seller George Friedman in Allegra Goodman’s The Cookbook Collector seems completely wrong for Jessamine Bach. He’s too old, too set in his ways, too cultured, and too much of a carnivore for the twenty-something tree-hugger. But theirs is a love affair born of books. And any man who goes about wooing with a perfectly ripe peach and a T.S. Elliot reference is a man worth keeping. Never has eating a piece of fruit been laden with so much sexual and intellectual tension. 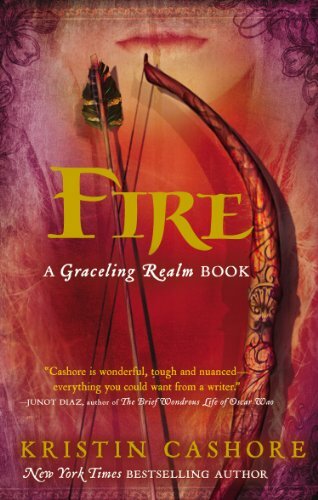 When Brigan meets the titular character in Kristin Cashore’s Fire, he’s not able to like or even remotely trust her. And when you have ugly family history of epic proportions between his father and hers, who can blame him? Unlike some folks, though, he’s open to seeing who she is as a person (or in this case, a human-monster hybrid) and eventually to trust her. That he falls so deeply in love with the one person he most despised speaks not to some weird “opposites attract” plot device, but rather to depth of his character. Which makes Brigan something of a dream come true, romantic hero-wise, and Kristin Cashore downright brilliant for creating him. So does identifying all of this make it so much easier to write a wonderful romantic hero (or two, as is the case right now)? Alas, no. But it does give me some key ingredients off of which to base my recipe. And take it from George Friedman: it’s fun to experiment in the kitchen.